Lakers guards Nick Young and Jordan Clarkson are accused of sexually harassing two women Sunday night, one of the women told ESPN.com’s Baxter Holmes on Monday. A Lakers spokesman told ESPN that the team is investigating the allegations. The Lakers released a statement on Tuesday about the incident. The woman, Alexis Jones, is an activist who routinely speaks to athletes about respecting women. She told ESPN.com that she and her mother were leaving a restaurant in Los Angeles on Sunday when a car carrying four men stopped beside them at an intersection and directed “vulgar, sexual” gestures toward her mother. After Jones posted a photo of the men on Instagram they were identified as Clarkson and Young. 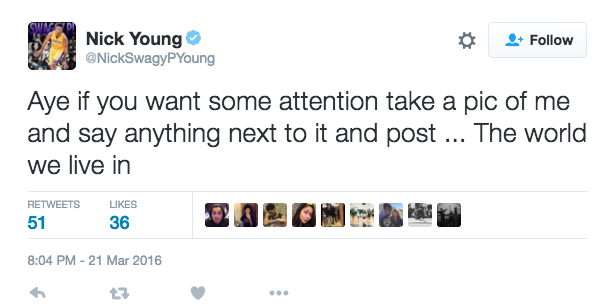 Young tweeted about the incident Monday evening and deleted the tweet less than 20 minutes later. Jones said a Lakers spokesman called her to apologize and suggested she speak to the team about sexual abuse and harassment. “I’ve been inspired by how the Lakers have responded,” Jones told ESPN. Clarkson, 23, and Young, 30, are third and sixth on the team in points per game this season, respectively. The Lakers have 13 games remaining this season.